Russia may raise the issue of the extradition of supporters of the Russian national football team who have been convicted in France once the lawfulness of the French court's verdict has been reviewed, Prosecutor General of the Russian Federation Yuri Chaika said Friday. 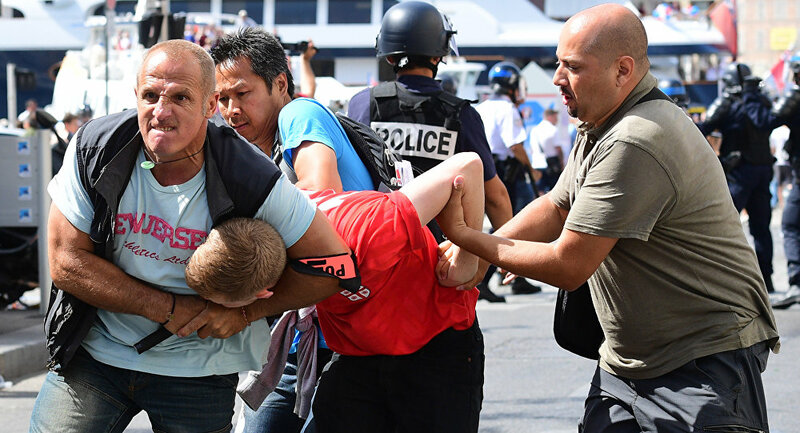 ST. PETERSBURG (Sputnik) — On Thursday, a French court sentenced three Russian nationals to prison terms ranging from one to two years over their role in the violence that unfolded in Marseille at the Euro 2016 football tournament. "We will consider the lawfulness of the verdict, and contact our [French] colleagues, I have given such instructions. We are dealing with the issue. We will look at what has happened. If there is no [legal] grounds, we will raise the issue of extradition," he told journalists on the sidelines of the ongoing St. Petersburg International Economic Forum (SPIEF). On June 11, the Russian national football team drew with England in a match in the French city of Marseille. After the game, clashes between Russian and English fans erupted at the stadium and in the port town. As a result, at least 30 people were injured. Following the incident, 20 Russian fans were placed in a deportation center.